Missouri state policy allows students to earn dual credit for academic or CTE postsecondary courses taken at their high school or a postsecondary institution. All public postsecondary institutions in the state are required to accept dual-enrollment credits (ECS, 2015). The Gateway to College National Network, National Council of La Raza, and Woodrow Wilson National Fellowship Foundation have partnered with institutions of higher education to each provide one Early College High School program as part of the Early College High School Initiative (ECHSI). More information about schools participating in ECHSI is available at the ECHSI website (Jobs for the Future, n.d.). In Missouri, individual planning activities help all students plan, monitor, and manage their academic achievements, as well as their personal/social and career development. The foundation for individual planning will be established during the elementary school years through guidance activities. Missouri's Personal Plan of Study (PPS) is mandated by the state. It includes all students in Grades 8–12. 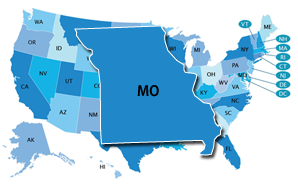 Missouri’s state-specific Early Warning System is called the Missouri Model Schools Dropout Prevention Project. The level at which Early Warning System data are reported is not publicly available. School and district teams can access Early Warning System data.